Chronicles the history of Boyle Heights past, present and future. 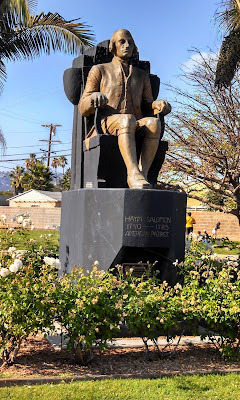 This is the third and final part of a post by Boyle Heights Historical Society Advisory Board member Rudy Martinez on a little-known statue for a largely-forgotten figure from the American Revolution, Haym Salomon. We hope you've enjoyed this post and come back soon for more posts on the fascinating history of Boyle Heights! Demographic changes began quickly in Boyle Heights at the end of World War II as many longtime Jewish residents began moving to West Los Angeles, the San Fernando Valley or other regional locations. 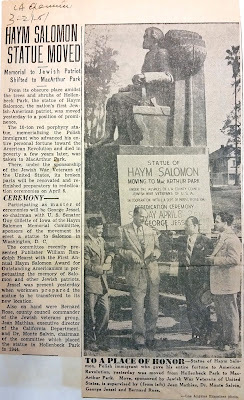 By 1951, when many Jewish residents had already moved from Boyle Heights, plans were made by the Haym Salomon Committee and the Jewish War Veterans of America to relocate the Haym Salomon statue to the west side. 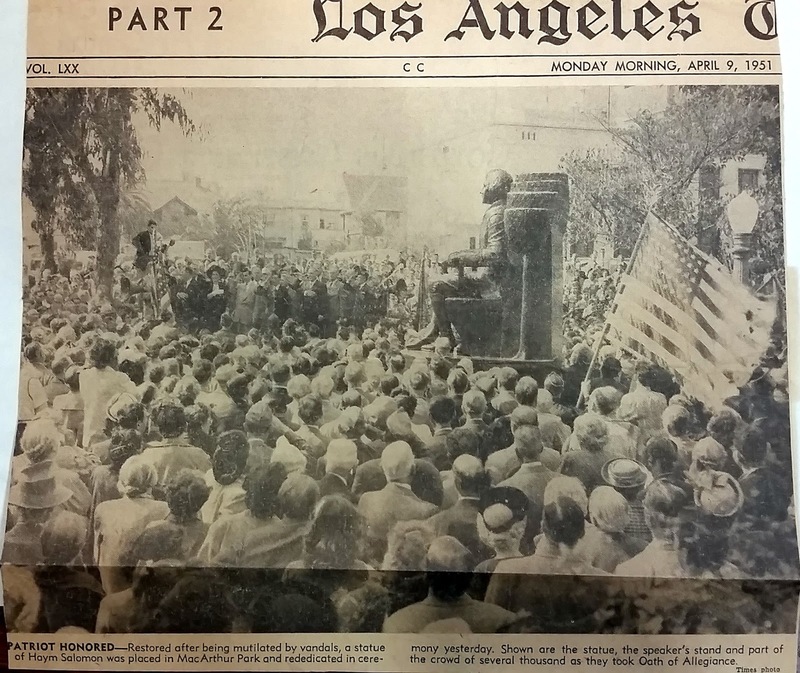 The March 21, 1951 issue of the Los Angeles Daily Examiner reported on the activities surrounding the removal of the statue from Hollenbeck Park. Los Angeles Daily Examiner, 21 March 1951, courtesy of the Western States Jewish History Archive Collection, Charles E. Young Research Library, University of California, Los Angeles. The 12-foot tall, 13-ton monument was hoisted onto a flatbed trailer along with a sign announcing its new location on the western edge of downtown Los Angeles—this being the recently-renamed MacArthur (changed in 1942 from Westlake) Park on Wilshire Blvd. The opening paragraph of the Herald story described its relocation as a move, “[f]rom its obscure place amidst the trees and shrubs of Hollenbeck Park . . . to a position of prominence” in its new home. Los Angeles Times, 9 April 1951, courtesy of the Western States Jewish History Archive Collection, Charles E. Young Research Library, University of California, Los Angeles. 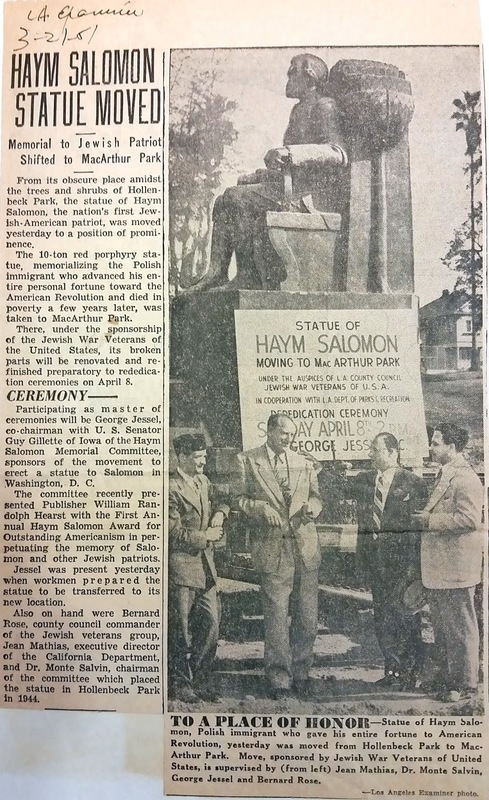 The rededication ceremony in MacArthur Park was held April 8, 1951 and that date was declared Haym Salomon Day by the city. The two-hour program featured a parade, an address by Mayor Bowron, a printed program for the event, and claims of a bigger crowd than that of the original dedication. Los Angeles Times, 9 April 1951, from microfilm at the Los Angeles Central Public Library. Due to vandalism in its last few years at Hollenbeck Park, the statue needed much repair and refurbishing before the event. By this time, the original artist, Robert Paine, had passed away, so the restoration of the statue was handled by sculptor Frederick Martinez. Evidently, the statue may not have fared any better in terms of vandalism in its new home at MacArthur Park because, on December 8, 1958, the L.A. Times reported that another ceremony was held for the “refurbished statue”. After some twenty years at MacArthur Park, changing times led the Haym Salomon statue to change its home. 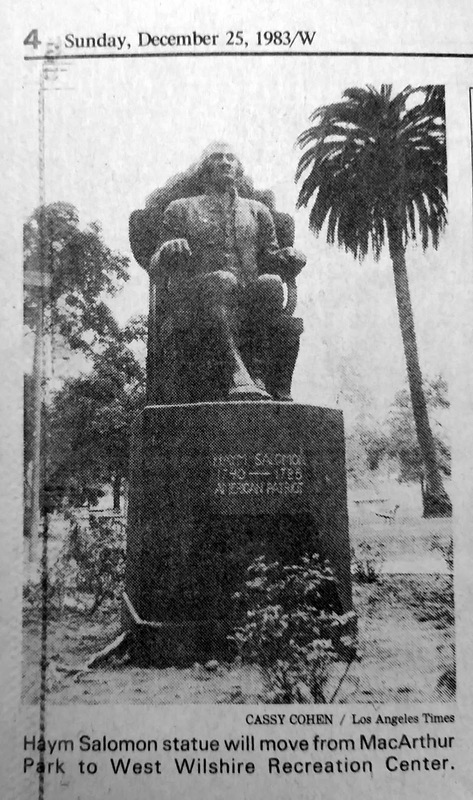 In an Los Angeles Times article from April 29, 1972, concerns again were raised in the Jewish community that, due to further damage, as well as Jewish residents leaving the MacArthur Park area and moving further west, the statue should be relocated. 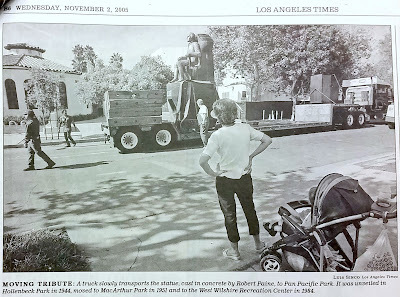 So, on January 1984, with the Jewish War Veterans financing the move, the statue was once again hoisted onto a flatbed trailer and relocated to the now bustling Jewish neighborhood of the Fairfax district. According to Al Goldfarb, public information officer for Recreation & Parks in 1984, “Salomon's is the most frequently moved statue in the city's park history.” The statue's third location (if you're counting) was now in front of the new West Wilshire Recreation Center, at 1st and Gardner streets, the site where the historic Pan Pacific Auditorium burned down in 1989. Los Angeles Times, 2 November 2005, from microfilm at the Los Angeles Central Public Library. The statue remained at the location for only 11 years. Plans to expand the recreation center and the surrounding area required that it be moved. Some thought the statue might be more prominent if it served as part of a new gateway entrance to Pan Pacific Park at the corner of 3rd and Gardner, a block east of the Grove shopping center. The work to remove the statue began on November 1 2005, but, as an L.A. Times article noted the next day, movers were surprised it clung stubbornly to its concrete base, and an estimated 30 minute job to remove it turned into a 4-hour project. On June 12, 2008, councilman Tom LaBonge, and the Jewish War Veterans Department of California, Hollywood Post No. 113 sponsored a re-dedication ceremony to celebrate the statue on its “final stop on its journey West.” This was its fourth location in 64 years. The Haym Salomon Statue at Pan Pacific Park. Photo by Rudy Martinez, June 2015. Like the community that honors him, the statue appears, after its journey from its original Boyle Heights location, firmly established in the Westside's Fairfax District. 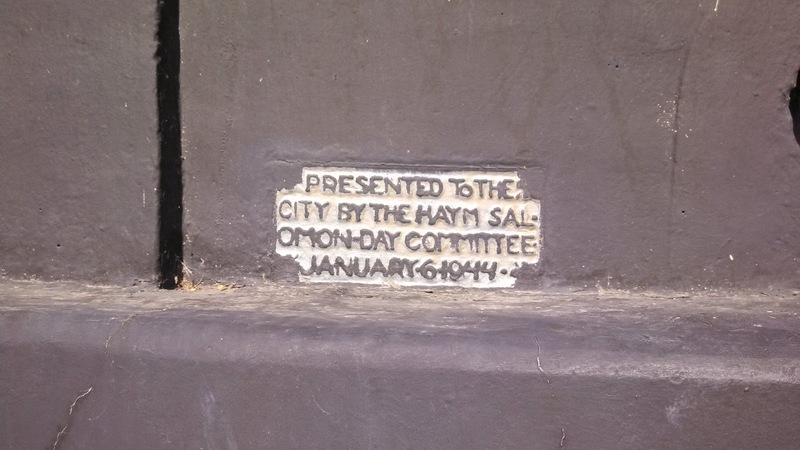 However, if the neighborhood's demographics should change at some future point, the custodians of the Haym Salomon statue have displayed a determination not to leave it behind. As mentioned earlier, a plaque installed at the foot of the statue lists the names of the parks where the statue has been located, in chronological order, sans any dates; but if you look to the bottom-left side of the chair on the statue itself, though, you can still see the engraved, original dedication date, January 6, 1944. 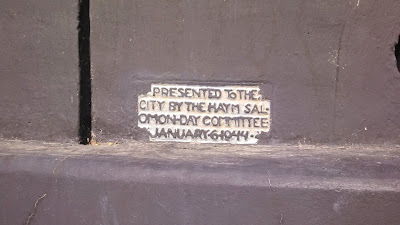 The original inscription from the 6 January 1944 dedication of the Haym Salomon Statue at Hollenbeck Park on the bottom left of the chair/base. Photo by Rudy Martinez, June 2015. On a closing note, one mystery remains. 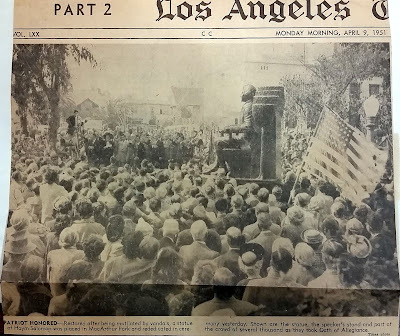 From all the newspaper articles and the other various reports that have followed the statue's move from east to west, there are no reports of whether or not, at some point, anyone recovered the copy of the 1939 Warner Brothers short, Sons of Liberty, which was placed in the base of the statue in the original 1944 dedication in Boyle Heights.